My first surprise was that the book’s title doesn’t include the definite article – so not only had I not been reading it for 26 years, I’d also been mispronouncing it ‘The’ Lord of the Flies – is my face red! Ya’ll know how it goes: schoolboys; plane crash; island; tribes; tragedy; rescue. Sentence-by-sentence Golding’s choice of language is simple and readable – events unravel slowly and with more than a little repetition, but this all contributes to the novel’s sinister sense of impending crisis. The opening is crammed with adjectives and introduces its large ensemble cast in one single short scene; but conveniently each crash survivor possesses a set of physical characteristics that function as both memory-aids for later appearances and visual signifiers for their future tribal inclinations. Straight-backed, ‘golden’, lean and well-spoken Ralph becomes the exemplar of rhetoric, democratic reason and leadership, whereas his sinister shadow and alter-ego Jack is a savage and violent tribesman – proclivities belied by his feral red hair and broad shoulders. By contrast, the be-spectacled, asthmatic and obese ‘Piggy’ functions as character-metaphor for intelligence and wisdom: his swollen body all but useless and unnecessary, his brainpower and glasses give him access to the most evolved technology on the island – making fire. Sure it’s a twee exploitation of visual stereotypes, but this externalisation of inner truths imbues Lord of the Flies with an almost Disney-esque vibe of fairy tale – evil, corruption, honour, kindness (etc.) are indicated as much by outward appearances as action – and this places the novel firmly within a familiar tradition of allegorical signification in which everything acts as symbol: a shell stands for democracy, fire is adult responsibility and a pig’s head becomes (almost literally) Satan; hence the novel’s unusual stringency in directing the reader’s visual conception of its scenes to a specific aesthetic. Most attention-grabbing of the cast, however, is Simon – frequently interpreted as a martyr or Christ figure due to his brutal murder at the hands of both rival tribes – I prefer to read him as sympathetic point of view character upon which readers are invited to project themselves. His political disinterest and complete lack of physical description are traits unique to his presentation and establish Simon as somewhat of a blank canvass upon which the reader can paint his own image. Simon’s refusal to pick sides and his frequent assertion that he is ‘on the outside’ give him an outlier identity that correlates him with the reader as onlooker – present, but separate. Likewise his ability to see the island’s ‘Monster’ for what it really is, the depth of his empathy towards the younger children and his clairvoyant understanding of their every need suggests he has access to information that should otherwise only be available to the reader. The moment of Simon’s murder marks the point at which the slow-burning entropy of the narrative explodes into outright anarchy – both literally as a sequence of brutal events, and figuratively in a dramatic change in the book’s language and style. Killing Simon is, then, akin to killing the reader as mitigator of order and another way; it’s not a perfect analogy, but Simon’s death marks a definite volta through which Lord of the Flies suddenly shifts into a dramatically unstable work of imagism, narrative breakdown and primal chaos. The aforementioned clarity of physical description is replaced by ambiguity and metaphor: the boys lose their individuality and meld with both their surroundings and each other – initially through the liberal application of improvised war paints, and later through a behavioural descent into animalistic savagery – they don’t so much start to resemble the jungle around them as they actually become it; Ralph’s once golden hair now is ‘tendrils’ and ‘creepers’, and ‘cries of fear and panic’ are indistinct from the natural animal sounds of the forest; it’s impressive stuff. Imagine my disappointment, then, when I came to the book’s ending – the deus ex machina that is the boys’ notably undramatic rescue by the British navy (…deus ex aqua?). I had a better ending in mind: the film reel in my head had the camera slowly pulling away as the island burned and the boys preyed upon each other– without rescue or resolution. Not only does the actual ending (with its return to a drab linguistic normalcy) undermine the brilliant post-structuralist breakdown of morality, language and reason that serves as allegorical end-game portent(/warning) for any society similarly unravelling, but it somewhat weakens the more general coming-of-age themes implicit in the novel’s events with an illation that suggests ‘it’ll all be set right in the end’, which definitely dulls the blade of the book’s message about the adolescent dawn of responsibility and consequence. Furthermore, the British navy’s pompous alighting to save the ‘savages’ from themselves has a colonial leaning to it that I neither expected nor welcomed – I’m aware it’s a product of the book’s time and should be viewed in context of contemporary western attitudes, but it’s nonetheless a difficult thing to encounter in a novel I was otherwise enjoying. Similarly, many of the book’s obsolescent phrasings make for uncomfortable reading; “Are we civilized or are we negroes?” becomes a common refrain in later chapters, and is hard to dismiss as a mere idiosyncrasy of the speaker, so prevalent is the sentiment. While I would never accede to the censorship of such things (remember the embarrassingly hysterical public reaction to the recent re-publication of Tintin in the Congo? ), their value today is more historically educative than morally insightful. Some of Golding’s… um… choicer passages are akin to hearing a casually racist grandfather spurting epithets that are, frankly, at home in a more patronising past, and best left there. Obviously such things shouldn’t be swept under the carpet and ignored entirely, but neither do they warrant decrying the whole novel for – it’s better to engage with them critically (‘deal with it’) than to discount them or boycott the book as a result. As I’m discovering with H.P.Lovecraft, it is possible to enjoy/engage with art despite an ostensible dissimilarity with your own moral sensitivities. Irrespective of these niggles, Lord of the Flies is a strikingly impressive and vertiginously dark horror novel that functions successfully as both a bleak reimagining of the much-worked coming of age yarn and allegorical warning against the societal implications of greed, selfishness and the will to power. I had trepidations going in, which I mostly put down to my reactionary and juvenile hatred of all books on the GCSE English syllabus – but I’m grateful to have read it sans the fun-sucking pressure of an impending exam, which I feel colours many people’s negative reaction to the book. If you’ve not read it: do so. If you read but hated it when you were sixteen: read it again. And if you’ve read it and loved it, well – I hope you found something here interesting. Sorry for the length of this review. And its abrupt ending. 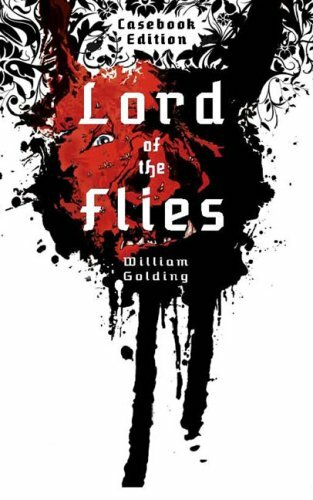 This entry was posted in Novels, Reviews and tagged Lord of the Flies, William Golding. Bookmark the permalink. great review, although I remember reacting to the ending a little differently. I suppose I didn’t really see the boys as having been saved (it’s far too late for them!) – but that’s my own cynical take on things. I’m glad that I didn’t have to study this in school, either; I know a lot of people who hate this book and that’s a shame, because Golding’s prose actually astounded me when I read it. I’ve bought The Inheritors in the hope that it’ll have a similar impact! I actually really like the ending, and think it’s quite important. It shows how easily they slip from civilisation into savagery, and then how easily back again. It also means that everything that happened was pointless. There was no need for the deaths. All they had to do was wait. It actually for me makes it all much bleaker. Lovely points on the use of physical character as shorthand for role in the fiction. Something I totally missed (unsurprisingly) when I read it as a kid. I should reread this, but like Lucy I plan to pick up The Inheritors which I have high hopes for. I’m kinda divided on the ending. As a denouement to a coming of age story, it works well; it makes the boys to realise that their actions have consequences etc and that the age of responsibility has finally reached them – facing the adult world after so long forces them to re-asses their actions, this time through the eyes of adults, and see the pointless violence and degenerate behaviour for what it is. It’s the point at which they grow-up. The ending functions as a good metaphor for the adolescent moment when we all have to leave behind out more egotistical childhood desires and take responsibility for how we act. I still think the idea of ‘rescue’ is a tad damaging though, as it lifts the onus of moral responsibility from the boys’ shoulders by kinda suggesting that no matter how bad things get, something external will set it right/save you/stop degeneration before it becomes total. But as a social allegory, I think the ending kinda falls flat – any society similarly unravelling and falling into chaos isn’t going to be rescued by an outsider arbiter (unless, of course, you take the colonial interpretation with which I was uncomfortable), and as a work of societal parable, I think that self-destruction would have been a more powerful ending, especially if Golding really wanted to hammer-home a message about what happens when selfishness, violence and an obsession with individual power take hold of a society. It’s difficult though, isn’t it? When two allegories (coming of age (‘bildungsroman’, I guess) *and* social microcosm) are functioning together, it’s kinda inevitable that one of them is going to end up the weaker figuration of the two, as maybe events can’t pander perfectly to both. The ultimate book for showing that moment when adolescence ends for me, and far more disturbing with it, is Burgess’s Clockwork Orange. It’s a novel which on reflection does manage to balance those two different allegories you refer to. The film is much weaker for not including the book’s ending. Wow, won’t ever forget the shock of reading this book, though it would be interesting to go back and reread it as an adult and without the naivete of youth. Great review. Please don’t be cross as I am about to admit that I haven’t read all of this review, BUT that is because I too have “misplaced sense of obligation to the literary canon (read: I’ve not read a ‘classic’ in a while)” and have been considering this book and yet concerned that I too might “have a one-night stand with it; carve its figurative notch into my equally figurative literary bedpost and never engage with it again” so you have voiced my fears. Now I might actually have a go at it. Not instantly, but sooner rather than later, so thank you. P.S Oh and never apologise for not blogging, you need time to live and read. I cant decide out of those two which is the most important. Ha. But can we really consider Lord of the Flies part of the canon? It is a classic all right, but that’s only because of its popularity with secondary school curriculum planners. There is a shocking lack of discourse at the undergrad or postgrad level on this novel, not because it’s old and doddy or the domain of 16-year-olds, but because the book isn’t very innovative, in the sense of form, and technical innovation. I love the story, but I’m starting to consider the technical dullness of this novel.